What is the true meaning of righteousness? You will discover that this biblical term refers to your relationship with the Father. Learn how to apply it to your daily life. This teaching will also show you how to become righteous, how to receive righteousness, and how to walk in it daily. You will discover that righteousness is not an external thing; it is something you receive in your spirit at the new birth. These truths will eliminate condemnation and cause you to revel in the precious gift of righteousness. The term "righteousness" has become a religious cliche today. Few people really understand what it is, and still fewer see its relevance to daily living. 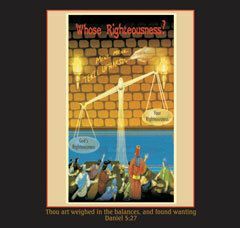 Righteousness is the Biblical term that refers to our relationship with the Lord. It describes our right-standing, or lack thereof, with the Father. It's essential to our eternal destiny, and no one can experience God's blessings in this life without being made righteous. Righteousness is mentioned one-and-a-half as many times as faith is in the Bible. It's imperative that we understand and apply righteousness to our daily lives. How Can I Be Righteous? This teaching not only reveals what you must do to become righteous, but it explains how and where we receive righteousness. Our actions and thoughts are progressively being changed to reflect the righteousness that is placed in our spirits at the new birth, but righteousness is not an external thing. We are not becoming more righteous. At the new birth, our spirit becomes as righteous as Jesus and remains that way. Our actions should reflect that inward change more and more as we walk with the Lord, but righteousness is a permanent condition of the heart. Jesus said, "to whom little is forgiven, the same loveth little" (Lk. 7:47). Does that mean that those who have lived good lives are not able to love the Lord as much as those who have been great sinners? That would be the logical conclusion if we compare ourselves with others for relative sinfulness. But when we compare ourselves to God's perfection, we all have been forgiven an incalculable debt. How much we believe we have been forgiven is a matter of perception and is not dependent on our actions. Therefore, the condemnation of the Old Testament law does serve a purpose. It reveals our true unworthiness and makes the gift of righteousness more precious.